Published 3/21/2011 . Last updated 1/8/2019 . “Tastes like soda,” commented Groom 4.0 when I had him try these cherry Coke cupcakes without knowing what they were. Score! Goal achieved. He went on to say that if Bride 4.0 didn’t pick these as her choice for their wedding cupcakes, he would replace his selection, Piña Colada cupcakes, with these. He didn’t need to worry – after two bites of these moist maraschino-filled cherry Coke cupcakes, Bride 4.0 was already picturing 80 of them on her wedding cupcake stand. Cherry Coke cupcakes require an ingredient that you don’t have and probably aren’t going to be able to find at any store near you. Sorry! The good news is that it’s cheap (just $5.95) and I’ll tell you where to get it online (no, I’m not being paid to write this, and I get no kickback). The secret ingredient that is no longer a secret is Kool Kola extract from The Homemade Soda Company. While there are quite a few recipes online for cola-flavored cupcakes, what makes mine really pop (soda-pop that is) is the cola extract. I use it in the cake (in addition to actual cola) and to make frosting that tastes just like Coke without being watery. You could certainly try making cherry Coke cupcakes without the extract, but they just won’t be the same. I got the idea for putting the whole maraschino cherries directly into the cupcake from Annie’s Eats. Her version of the cherry coke cupcake is definitely worth checking out. The cupcake recipe itself is an adaption of the root beer cake that I used for my soda fountain cupcakes. That recipe originally came from BitterSweet. Jonathan made these wavy Coke-inspired cupcake wrappers using our Silhouette (read my post on creating cupcake wrappers for more on how that works). He will not be making custom wrappers for the wedding (it would be way too much work, considering I’m baking cupcakes and he’s the wedding photographer), but we really liked the way they turned out. looks amazing. cherry coke zero is one of my favourite treats, can’t get it here in Canada which probably is a good thing. Also when groom 4.0 said “tastes like soda” well Duh. Hello! I recently received the Stylish Blogger Award and am passing it on to you! I absolutely love everything about your blog, such a fun idea! What unique cupcakes. 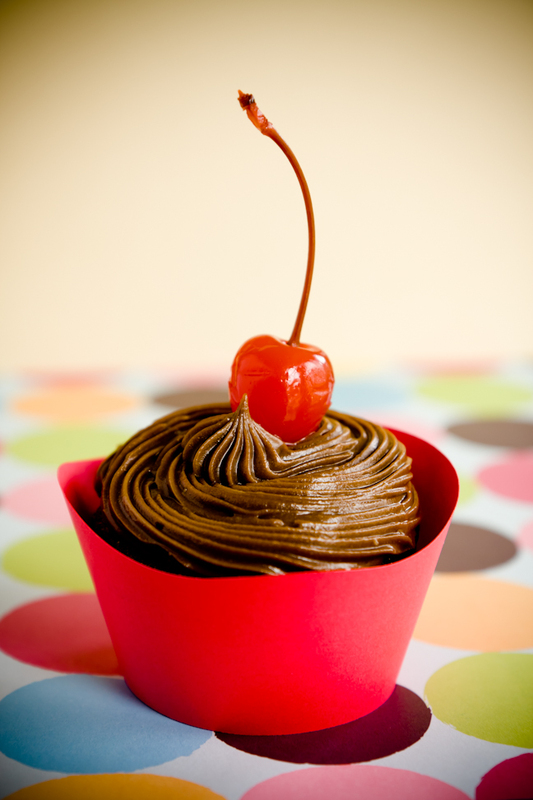 Thanks for this recipe for cherry coke cupcakes. umm…can i say YUM!! what a cute (and delicious) idea for a cupcake. What a genius idea for a cupcake! Definitely going to try them soon! So I’m definitely buying this kola extract to make whiskey coke cupcakes but coulnd’t find how many oz the extract is. Can you help me with that since you’ve already bought it? Thanks! Anna – Yeah, I don’t know why it doesn’t say. I had to call them and ask when I bought it. It’s 4oz. Wow – this looks amazing. Presentation is everything and you get an A for presentation. These look amazing! Definitely on my “to-make” list! The only way to improve these is to introduce pop rocks to the icing, so it feels all carbonated. I’m wondering if a Cherry Coke reduction could be used in place of the extract?? I see an experiment coming . . .
Arni – The problem with pop rocks in icing is that they pop as soon as they get moist. It’s a great idea though. Let me know if you can figure it out! Tugs – Let me know how that goes! I realy must try to make this one. How cool is’nt the flavoring!? I made these cupcakes last night for Easter today and they were awful. No depth of flavor, unfortunatly flat. I had ordered the Kool Kola syrup and drove all the way to Whole Foods (good excuse to go, so the ingredients were the same. Nice idea, so I thought I would try the Annie’s Eats version and it was very good. I think the cocoa powder and cherry juice made a huge difference. I did a blind taste test with the family and they chose Annie’s version hands down. Kim – I’m so sorry to hear that you didn’t like them. They were a huge hit with the wedding couple and everyone at the wedding. But, of course, people have different tastes. Glad I was at least able to provide inspiration and a link to a recipe that you ended up enjoying more. The maraschino cherries that you use for this recipe – do you recommend the homemade version and would that make a difference? Suffern – I used the the all-natural maraschino cherries that I found at Whole Foods. You could also use the homemade kind. Any kind would work, it’s just depends on which cherries that you prefer the taste of. Thanks. These were a hit at the bake sale. I did use your homemade marschino cherry recipe. I was worried that the cinamon would interfere with the cherry coke flavor but it did not. I also added about 2 t of the liquid to the icing to give it a hint of cherry flavor as well, since I drink cherry coke for the cherry more than the coke. Lisa – I tried it with just the cherry juice and I didn’t think the flavor came through very well. You could blend the cherries up so he doesn’t notice them. Could you use Soda Streams cola syrup instead of the extract? Its much easier to find in the stores such as bed bath and beyond, kholes, and best buy. It runs about the same price as the extract but its about 17 oz. Lulu – Which ingredients? I may be able to help, but it’s hard to say. Callie – It might work, but it wouldn’t be as strong as the extract. Anon – That would probably work and would certainly be worth a try. Have you ever made a cake out of these cupcakes? I have had a request for them to be made into a cake. OMG i cant wait to try these!!!!!!! of the posts I realized it’s new to me. Regardless, I’m certainly happy I discovered it and I’ll be bookmarking it and checking back regularly! These were delicious! I’m a huge cherry cola fan, and these did not disappoint! If I could make one minor suggestion… In step 1 of the recipe you said to combine the soda and vinegar… I mistakenly used the baking soda at this step. When I got to step 3 I realized my mistake and started over. It wasn’t a huge deal, but you might want to call it cola in step 1 instead of soda. These definitely received rave reviews in my house though! Thanks for the recipe!